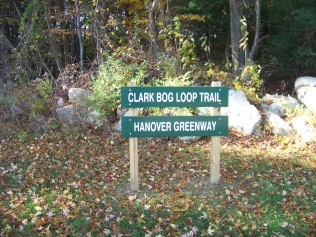 Of the many hiking trails of the Hanover Greenway the Clark bog loop trail is one of the short and sweet hikes. It is located to the left side of the Forge Pond Park in Hanover on King st. When you enter the park the trail head sign will be on the far left of the field. 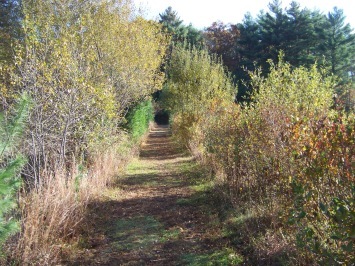 It is a short loop around a former bog owned by the Clark family of Hanover. The Clark family (most notably being George J.J. and his son Melvin) owned a considerable amount of property in the area. Across from the forge pond park you will see another trail head for the fireworks trail. The fireworks that this trail is named after are the National Fireworks Co. that the senior Clark was the founder and owner of. Originally the fireworks produced were for personal use. If you live in this area you may have remembered and even bought the sparklers this company produced. airport in the mid 1920's to late 1950's. During war time both properties were used in the making of munitions for this country's military. the area above wet ground. When accessing the Clark Bog Loop Trail, there may be some uncertainty as to where the trail actually begins. 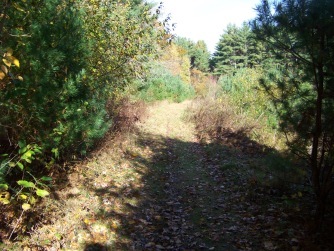 There is a road that enters into the wooded area and the loop trail enters on the left of this roadway. There is no marking to separate the two. This roadway seems to be another "trail" unmarked and unnamed. 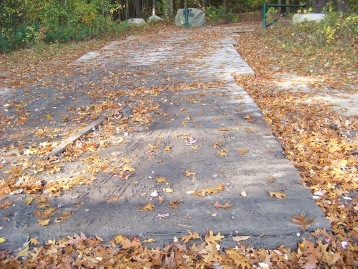 Yet on the map of the Forge Pond Park Trails this is referred to as the Old Rockland Fireworks Trail Loop. It appears to be an extension of the fireworks property as there are remnant buildings similar to those found on the fireworks property. The trail takes the first left off this roadway and following to the right will bring you parallel to the unnamed roadway trail. 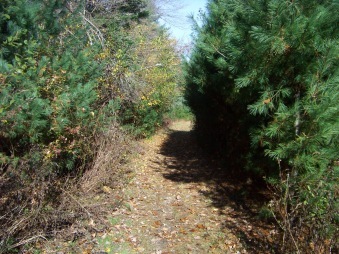 The hiking trail makes another opening to the unnamed roadway shortly after the first one. It is here the trail takes a sharp left and follows along the bog. The trail around the bog is only about 1/2 mile at best but a very pleasant hike. 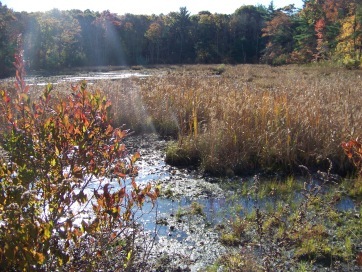 The hike around this bog takes the shape of a large rectangle. The surface of this hiking trail is a grass covered dirt road lined in either pine saplings or flowering plants. Being a bog it contains a pond covered by all sorts of grasses and low growing plants. At the far end is a pond. 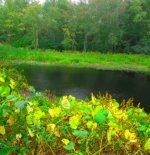 With all the water and natural growth of the bog and other plants, this is a great environment for birds. And of course bird watching! from Boston take route 93 south and route 3 at split. Take exit 14. At end of ramp take right on to Hingham st. into Rockland. At end take right at lights onto Webster st. Follow to first intersection with Liberty st taking a left. At end take left on Market. This will become Hanover st at line. At lights take right on Circuit. Take right on King st. Forge Pond Park will be on the right.